Through numerous non-audio engineering experiences, company founder and president Michael Griffin developed an in-depth understanding about the relationship between changes in voltage and current. Capacitive and inductive properties of various electronic components effect the rate-of-change in current as a response to a change in voltage. Most pro-audio engineers and audio component designers understand and accept this relationship in circuit design, yet dismiss the potential performance effects of the AC power cord, which forms the incoming and outgoing legs of the series circuit to the component's power supply. If it's not enclosed in the component chassis or a power conditioning "box" that contain discrete components like capacitors or a transformer, it must not have any inductive or capacitive properties, right? A lifelong music lover and audiophile, and not constrained by industry paradigms, Griffin took a "clean sheet" approach to optimizing an AC power cable design specifically for audio applications. His efforts resulted in a cable geometry employing multiple small-gauge line and neutral conductors connected in parallel, spiraled around an oversized ground conductor, all sheathed in a maximum coverage braided copper shield. Michael Griffin was awarded a U.S. patent for his product invention in 1999. 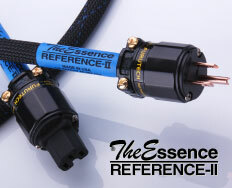 The first product based upon this new technology introduced in 1995 was the original "The Essence" power cord. The original version was made entirely by hand! Now available in its 5th generation "Reference-II" version, The Essence continues to be our statement product, our "Corvette". The Essence Reference-II incorporates the best design, materials and processes to provide the most emotionally engaging, realistic, state-of-the-art performance from high-end audio hi-fi systems for the most discriminating audiophiles. We realized that The Essence was not a product that would be affordable to the average music lover, musician artist or pro-audio professional. So, the next challenge was to re-engineer the design for mass production. Also, no power cable with multiple line and neutral conductors had ever been validated to meet industry safety standards. 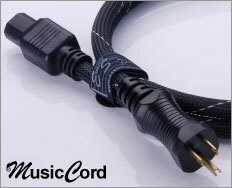 After several years of development, "MusicCord" and "MusicCord-PRO" power cords were introduced to the musical instrument and pro-audio markets. These mass-produced power cords combine patented multi-conductor cable geometry with road-worthy build quality. In fact, MusicCord power cords have been proven to exceed hospital grade standards for mechanical integrity! Yes, MusicCord power cords have achieved our goal to make our AC power technology accessible to practically anyone who takes their sound quality seriously! MusicCord power cords are well on their way to becoming a de facto industry standard. Their universal applicability means MusicCord can and is used with most every type of audio component including instrument amplifiers and various studio gear in every stage of music production. Some of the most respected musicians and industry professionals have endorsed MusicCord for its game-changing sound quality improvements. Essential Sound Products power cords dramatically increases current flow while filtering phase distortions and improving the transient performance of the component power supply. Our power cords improve clarity, resulting in more precise spatial location of instruments and voices in the soundstage. Tonal balance has more natural warmth and bass has more extension and tighter control. Transients are fast and clean yet harshness is eliminated. Like any other cable, the power cord can pick up RFI distortion. Our shielded cable construction prevents RFI interference and controls the magnetic field that surrounds the cord, which can cause distortions in signal carrying cables. The lower noise floor means greater resolution and increased usable dynamic range in a digital recording or playback environment. The first time you hear the sound quality improvements afforded by using Essential Sound Products power cords with your audio system, it is a revelation! With modern digital recording and playback systems, in many respects, our power cords are "the missing link" that allows digital sound to realize its full potential. By eliminating ac power distortions, digital sound has all the "ease" and fluidity of analog with all the inherent advantages of digital recording. With Essential Sound Products power cords, your audio system will deliver sound quality that simply put gives you the best of both! Essential Sound Products, Inc. was founded in 1995 to design and manufacture high-performance audio AC power cables and power distribution components based upon our unique technology. For over 20-years the company has been a leading industry innovator in the field, and today we continue our pursuit to offer products with the highest level of performance available at every price point we compete. Our products are used in practically every type of audio/video application including instrument amplifiers, studio recording mixing and mastering components, audiophile hi-fi home audio and home theater systems, PA and residential/commercial custom installations. Essential Sound Products is headquartered in Rochester, Michigan. All products are designed and assembled the USA.